BOISE, Idaho, Nov 20, 2017 (SEND2PRESS NEWSWIRE) — Organic Aromas(R) (www.OrganicAromas.com), maker of a wide range of premium aromatherapy products for the home and professional-use markets, has announced today its plans to further launch several exciting and unique new products for this holiday season. With the advent of its proprietary Nebulizing Diffuser(R) technology, Organic Aromas has revolutionized the previously static essential oil market by introducing some of the most beautiful and effective aromatherapy products available today. With no need for heat, water or plastic, Organic Aromas aims to restore health and true well-being to an aromatherapy market that has, heretofore, been inundated with tired, ineffective and even dangerous product options. Nebulizing diffusers(R) can disperse strong aromas across a wide area in a short time, allowing you to quickly and fully enjoy the complete therapeutic value and benefits of only pure essential oil without dilution, transmutation or adulteration. Organic Aromas continues to raise the bar again this year with the introduction of a variety of new items set to be big hits for this Christmas and into 2018. In all, there are at least four different new products. Expanding an already diverse product set, Organic Aromas will begin selling an all-new specialty nebulizing diffuser made from ceramic. No other product on the market is quite the same, the unique shape and new base material is certain to be popular as a fashionable piece of functional art. In addition, to bring more holiday cheer there will be a lovely new, colored Christmas tree glass and matching laser-engraved Elegance base this year. It is sure to bring extra joy to your seasonal celebration! On the essential oil front, Organic Aromas will continue to take the lead in creating cutting-edge products found nowhere else! 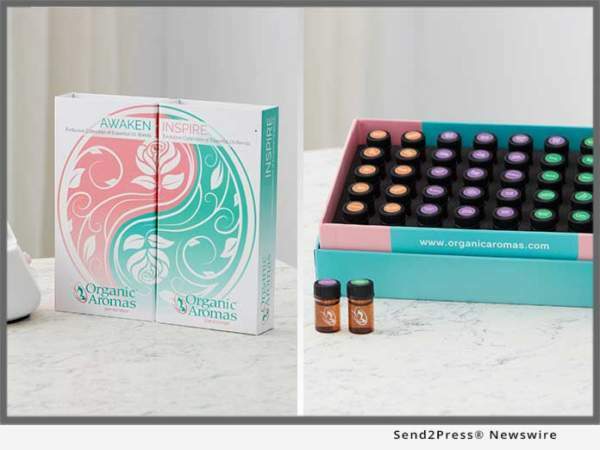 On the heels of the announcement that Organic Aromas(R) will roll-out third-party testing on all its essential oils, there will be an exciting and unique sampler box of 40 different blends, singles and organic pure essential oils for greater aromatherapy pleasure. This exclusive, new product is like nothing on the market. It will allow those new to essential oils a chance to try and experiment with a huge variety of different essential oils affordably and without any waste. Lastly, Organic Aromas(R) will begin a whole new era by introducing the first wireless, rechargeable Nebulizing Diffuser(R) to the market. Sleek and very effective, this ground-breaking product will allow the user to take their aromatherapy wherever they go. At home, on a trip or on-the-go, the convenience and power of this exclusive new unit may change the face of the industry forever. Organic Aromas(R) is a premium essential oil and aromatherapy brand that manufactures the most effective and beautiful aroma diffuser on the market. Using absolutely no heat, no water and no plastic this Nebulizing Diffuser(TM) can emit a heavy concentration of scent across a large area in a short period of time. These powerful aromatherapy devices can be used to enjoy the full potential therapeutic benefits of only pure essential oils and nothing else. Control a very strong aroma, instantly and for as long as you want it.